I have seen Coquette (reviewed here) three times, and I think about it more than anyone probably should. Here's why: Mary Pickford, essaying her first speaking part in motion pictures, is widely cited as the worst-ever winner of the Best Actress prize, and before you go around agreeing with a charge like that, you oughta be sure. Coquette itself is, if anything, even worse than Pickford's performance. The movie is instantly dated, maudlin, erratic, gaudily dressed, and technically slapdash, but before we get to feeling too superior, the real reason I dwell on the movie so frequently is that I often, while sitting before a new theatrical release, pose what I call The Coquette Test. Sure, it's easy to kick a 1929 movie that everyone already hates, directed by that same numbskull who, in the very same year, took a notorious "Additional Dialogue by" credit on his film version of The Taming of the Shrew. But if, say, The Last Station or A Single Man or Me and Orson Welles were also 80 years old, instead of just feeling like spotty and desiccated antiques, would we be any kinder to them than we are to Coquette? Have trophy-minded movies really gotten better, especially when you start ignoring publicists, "buzz," and ad campaigns, and when you avoid the oft-floated logic that just because a hundred Tooth Fairys come out every year that deserve nothing but opprobrium, we should induce a sort of Ivy League grading curve by which something as tawdrily mediocre as Station or Welles gets bumped up to a C? When a prestige movie starts heading south, or when it just starts out that way, I often ask myself, "Would I rather be watching Coquette? Is this movie any less incongruous in its own time than Coquette was in the era of Pandora's Box and The Passion of Joan of Arc?" Reader, I must confess, the face-off usually ends in a draw. But let's not dodge the issue: Coquette is a dog, and Pickford is barely tolerable in it. She handily gives one of the worst performances ever nominated for the Best Actress Oscar, and she won for it, almost certainly because of her stratospheric celebrity and her crucial role in founding United Artists as well as the Academy itself, only two years prior to her copping this trophy. Awfully cheeky to be 36 years old and playing an airheaded chit who can't help flirting with every man in the room, from her father's peers to the local bad boy. Pickford looks suspiciously dowdy, and not just because her infamous haircut has her looking so matronly, or because she's so perpetually clad in distressed housedresses and nightmarish effulgences of figure-killing tulle. Even amidst such intense internal competition, the most antique thing about Pickford's Norma is the actress's creaky performance style, yet this isn't an "old" style so much as a frantic, immature feint at what grand acting by established masters might look like. Dabblers in early cinema might assume that Pickford hasn't yet recalibrated her gestures or mannerisms to suit the new sonic capabilities of the medium, but you could watch silent films for days without seeing anything this garish. Pickford has no one to blame but herself for her insistence upon buttoning and almost corkscrewing her thin lips until her mouth looks like the knotted end of a balloon, and then calling greater attention to this bizarre mannerism by repeatedly pointing an index finger, inexplicably, to her face. She's a fright of uncontained energy, and not in that Clara Bow way that can be infectious in spite of itself; she looks harried and taxed, like she's somehow overthinking the part without actually thinking at all. She whinges, she scowls, she bends over backward as her boyfriend of ill repute whispers sweet pledges to her in a forest glade. She flails her arms in the air when she races across Southern streams to find him, and sinks like an eight-year-old into the lap of Louise Beavers, humming away as her loyal mammy (!). The close-ups are impossible to parse: if you didn't know that Johnny Mack Brown was playing the object of her adoring ardor, you'd wonder why she's sniffing and glowering at this fellow who has come to surprise her at a dance. Her odd vocalisms ("Ooh yoo doon't knoow my deddy!") make Singin' in the Rain's Lina Lamont seem like a creature drawn from life, and when her character gets dragooned into one of those fifth-act court-trial sequences that have felled many a better movie than Coquette, she quakes in her chair and whips her head about, letting her voice go so high and shrill that you worry she might be tearing it. In truth, such vulgar bathos represents the high point of what Pickford manages here: her spasms of grief and her wracking sobs of divided loyalty between her priggish dad and her rough suitor at least have some energy, unlike her unlovable take on the preening ingenue or her great-auntish lack of softness or ease in her mid-story clenches. Adding final insult to injury, I always misremember Coquette, which is subtitled A Drama of the American South, as a kind of mothy Hollywood pantomime of ante-bellum backwardness. Sadly, a series of party invitations that become key props about twenty minutes into Coquette confirm that this story is set in 1928, meaning that Sam Taylor thinks that women of the world were still saying things like, "Oh, what does it matter what I do? Oh, MICHAEL!" (when Michael isn't even around, incidentally), and Mary Pickford still thinks that the best use of her talents at 36 is to play an already specious character as 18-going-on-7, for maximum irritation and minimal sense of purpose. If the Academy has rarely got things as right as it did when it voted Janet Gaynor its first Best Actress, it's rarely (if ever) been as wrong as it did with Pickford. Even though I'm just a little annoyed with you for your absence (I hope you had a good excuse, you're not sick are you?) I must say I read the post quite rapaciously. I really feel bad for Mary though, something like this on her birthday, Nick. I know I saw this, but it's been mostly erased from memory - luckily, apparently. PS. Ummmm, what happens if you actually like things like The Last Station (moi)...where does that put you? And I know I keep bugging you about it, but did you see The Private Lives of Pippa Lee yet? So I'm watching a clip of Coquette right now on Youtube, pausing every now and then when it gets too painful. So, um, is this how Pickford was in all of her movies? Because I don't think there was even a girl in my high school drama class who would give a performance like this. Can I go off topic for a while? I need to get something off my chest. You really liked How To Train Your Dragon as many people did. I have a problem with this movie and I feel really alone in this world that seems to love it. I thought it was great until near the end, and then it all went wrong. I have great respect for the animated genre and that makes me expect, perhaps, too much. I don't really mind cliche messages but I think that the end of the film sends the opposite message than the rest of it. What were they trying to say? Don't kill dragons unless you can't make them your pets and use them as assistants in your daily work? I think that is exactly one of the things you didn't like in Avatar and you seem to be forgiving in this movie. I know I am obsessive over some things (like who is the bad guy and what should be done with him/her) but I really didn't see why we're supposed to be enjoying the fact that at some point, one boy hits the big dragon in the eyes. Um, the other dragons are good because they can be cute and this one is bad because he(it?) is ugly and doesn't like cuddlng? Plus, the father tells his son he is proud of him just after he killed a big dragon, using another dragon. So, the movie tells you "Don't try to be accepted by your parents for being yourself. Change yourself in the way they want you to, damm it!" Just to clarify, I'm not criticising one of my most beloved writers on the net. I just express my problems with the movie and why I was a bit surprised by a part of your reaction. I liked Pickford a lot in Stella Maris (1918) but then I don't have any problem at all ignoring modern acting styles and enjoying the silents. does this mean i will actually like her in COQUETTE (?!?) or is she just too terrible with her voice? A deliciously cruel "tribute," yes, but how handy to remind people of this wretched thing at a time when so many are still grousing that Sandra Bullock's recent win represents some kind of low point for the category. They have no idea how good we have it. Anyway, having you back just made my day. @Everyone: I never promised a rose garden, or a tribute! :) I'm just using a few birthdays as excuses to pull some performance vehicles off the shelf that I'd need to see again anyway to properly review. Bad taste, perhaps, in this case, but I wish someone else had been born on April 8, or that she'd been nominated for some of her good stuff. @AEE: By all means, like what you like! I just (evidently) have a hard time biting my tongue about my own reaction to The Last Station, et al. I've made it as far as renting Pippa Lee but haven't actually seen it yet. @Tim: I should probably be ashamed. But we're heading better places. Maybe not immediately, but eventually! @Robert: Most Pickford fans think she was never as bad as she was in Coquette; My Best Girl, only a year or two before Coquette is often singled out for praise (and see Nathaniel's rec below). @James: The "pet" turn at the end did bother me, though I like to think they're all just playmates and the dragons frequently repair to their own hangout, or at least show the kids who's boss. But the whole movie's just so energetic and spry and colorful and funny up till then, and I thought that last character beat with Hiccup, getting out of bed, was a lovely extra addition. I see what you mean about the relative treatments of different dragons, but that hulking thing that the dragons were feeding really seems to have no attributes beyond voraciousness, and I didn't mind that every single organism didn't need to be recuperated as friendly. Still, I think you make good points here. @Nathaniel: I don't think you'll be able to put up with Pickford in Coquette, cuz again, it's not like watching a silent performance style hauled into a talkie. Pickford almost never acted this way even in silents (hopefully almost no one did); it's an unholy blend of the worst of both aesthetics. Thanks for the rec for Stella Maris, though. @Guy: An especially choice moment from Coquette, yes! The last line is also heroic, as is her first news of the shooting, and the full-body premonition that precedes it. Swapping out popcorn for wine sounds like just the right approach. A lot's been said about this notorious bellyflop of a performance over the years. But trust you to finally give it the brilliant golden skewering it's been asking for for 80 years or so. You conjured up its ridiculous curlicued excesses so vividly I felt like I was watching it again. Thanks, I think. I never have bought into Mary Pickford as a great actress or even an attractive screen performer. But she was certainly good enough in, say, "Sparrows" or "My Best Girl". She did stink in all her talkies, though. Albeit never quite as pungently as in "Coquette". Watching the film is like driving past some colossal roadside accident. Appalling but impossible not to stare at. And of course the Oscar win is the final infuriating turd on top of the whole mess. By the way, I'll echo your other admirers in saying welcome back. It just hasn't been the same without you. P.S. Did you ever get a chance to catch "Together Again"? I rewatched it right after I recommended it to you - and found its charms still fully intact. Even Mona Freeman's (usually annoying) "mother-how-could-you" schtick worked for me in this films. And as for Irene Dunne - sublime. I'm cautiously optimistic you'll like it too. Man, almost a full month off, and you come back with a Coquette retrospective? It's kind of like if in 1998, Terrence Malick had directed Revenge of the Nerds V.
I kid, I kid. Mostly, I just feel incredibly sorry for you. Three times, you've seen this thing? I could barely survive it once, though happily my memories of it are entirely vague now. I know that I was constantly aghast, and that the threat of hellfire wouldn't get me to sit through it a second time. By the way, not to name names (Grace Kelly), but in the four winning performances you've yet to seen, you've got one of my own picks for the bottom-tier of Oscar-winning actresses waiting for you. So nice to be welcomed back by everyone! I do have to warn you, though: this whole year is an especially intensive one with my job, so don't hate me if there are a few outages like this. You need me gainfully employed so that I can keep renting lead-actress vehicles. @Ken: I still haven't seen Together Again, but I haven't forgotten the recommendation. @Tim: I am not much looking forward to Kelly, but finishing everything off with a Garland/Hepburn/Kelly square-off, doubtless with trips back to Dandridge and Wyman as well in their historically important films, will be a great way to conclude this whole exercise. Haha. I have to see this. I'm one for the laughably bad. I'll probably queue it up on Netflix. Haven't seen "Me and Orson Welles" and according to you I should not. Also, don't put monthlong gaps between posts again if possible! I'm a pretty devoted reader of this site and I anticipate each post very much. Having watched Kelly in The Country Girl just last week, I part ways with the other Tim in finding it probably her best work, though the perf (and the script) definitely fray towards the end. Bing Crosby, though, is weirdly great in it, and the movie far bitterer than you might expect. No need to be too apprehensive! Wow, Nick, a B- for The Runaways?! I'm surprised, shocked and happy. I thought for sure you'd rate it in C or D territory. Did your feelings of leniency with the '09 Best Actress candidates somehow rub off on this film, too (lol)? I also ended up liking it, despite its (many) flaws. I wish Sigismondi's screenplay's could of somehow maintained the level of originality that her striking opening shots set-up. @James T: Welcome to my world! I feel regularly peeved and alone when it comes to animated features (especially when it comes to Pixar and Dreamworks), because people either don't take them seriously enough or overpraise them despite their glaring flaws. I have much the same objections to Dragon as you did: the conflation of sentience and cuteness, the structural human superiority (keeping dragons as pets / defeating the dragon boss without real input from the dragons it terrorised), the unbelievable geek love-fantasy (and the lazy sidestep that the dragon wanted an apology from her, rather than annoyed at the assumption that he was a free ride), and the childish sidekicks who suddenly jump on the protagonist's bandwagon for his celebrity, not their empathy for the dragons. Not to mention the way the movie sagged with talky exposition for large portions of the time. Though I suspect I wouldn't be half as annoyed at Dragon's acclaim if the visual/storytelling momentum of Dreamworks' earlier Kung Fu Panda weren't so under-acknowledged, and if Dragons weren't following the exact track that WALL·E was, with all the cutesy montages bowling critics over. Must say, though, that I really can't argue with the lush world-building, character designs, and fun visual tropes from pop (Viking) mythology, but I often expect more from a movie, even one "for children". @Tim R: My chief problem with Kelly in The Country Girl is that she seems so horribly miscast. But maybe it's just that I'm so fond of her more typical, "gorgeous woman of society is gorgeous" shtick that I've got a mental block over seeing her doing something else. But you're spot-on with Bing Crosby, who notwithstanding the Going My Way/Bells of St. Mary's dyad is an actor that I think is often much more interesting than one would have right to expect. Yes, it's a horrible movie! Just horrible! 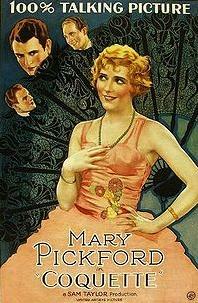 And Mary Pickford is certainly not good but I actually liked some parts of her performance. Still, one of the worst winners. For me, only Liz Taylor (BUtterfield 8), Jessica Lange (Blue Sky), Katharine Hepburn (Morning Glory) and Bette Davis (Dangerous) are worse. @Nick Duval: I didn't see a lot of "good" in those movies to see past, but I should stop beating dead horses, and I'm perfectly glad for other people to have liked them better than I did. Meanwhile, I hope you won't up upset with me for triggering you to watch Coquette. For maximum enjoyment, duplicate Guy's approach, as outlined above. @Tim: If anything, I'm already more excited for Crosby in that film than for Kelly, so this is great to hear. @CCW: I absolutely agree that the first half of The Runaways is pretty badly diluted in comparison to the opening shot(s). But just as I started feeling grumpy about wanting the movie to look more interesting and develop more richly, the second half seemed to improve (right around the Tokyo visit, for me), and/or I realized that the first half had actually set me up with more investment in the story and sensitivity to the characters than I had been realizing. Coulda been a C+, easy, but I walked out feeling appreciative. @Colin: I'm so glad you understand the regular interruptions in service around here, and I really appreciate that you, like all the others, keep coming back anyway. As for Dragon, I was frankly relieved that the beasts didn't have speaking roles, which sort of made the human/pet hierarchy a little inevitable, even if it leaves a slightly disappointing taste at the very end. A price I turned out to be more than willing to pay... and so many of the dragon designs are so explicitly wonky, even deranged-looking, that I don't think the movie on the whole is guilty of privileging cuteness über alles. But y'all know I love a good debate against the critical and popular tides. @Tim: Now I'm actually getting excited about Country Girl, which is very dangerous, with George Seaton plopped there in the director's chair. Thanks, Nick! I've been reading your blog for a long time and I love your Best Actress rankings and the Best Picture roundtables! About Kate: I don't hate Kate in Morning Glory, my big problem is that I don't care about Kate in Morning Glory because she makes her character sooooo uninteresting and even appaling. Fair point about the dragons' designs, and I can see where you're coming from with regards to their non-speaking roles, given Dreamworks' track record. And I suppose I was setting myself up for trouble by calibrating my expectations to Chris Sanders and Dean DeBlois' earlier Lilo & Stitch, but that film handled a similar human/pet relationship without ever feeling like it ceded superiority to the human; without snuffing any serious belligerence from the pet from the get-go (and unlike Stitch, the dragons even have good reasons for being belligerent against humans! ); and without assuming the cementing of this relationship just because the pet has no other choice. (Sure, Hiccup stays his hand when Toothless is helplessly bound, and then feeds Toothless when he'll otherwise starve, but there isn't much that Toothless could do but accept Hiccup's kindness in these setups.) And just to further complicate the "cuteness" point, isn't it more than a coincidence that the most feared of the dragons should also be the cutest? "Her odd vocalisms ("Ooh yoo doon't knoow my deddy!") make Singin' in the Rain's Lina Lamont seem like a creature drawn from life, and when her character gets dragooned into one of those fifth-act court-trial sequences that have felled many a better movie than Coquette, she quakes in her chair and whips her head about, letting her voice go so high and shrill that you worry she might be tearing it." I HAVE TO SEE THIS MOVIE. The End. I agree with you that this is a horrible movie. Anyway, it's my first time visit your blog and I found a lot of interesting posts on your blog. Glad to found you!